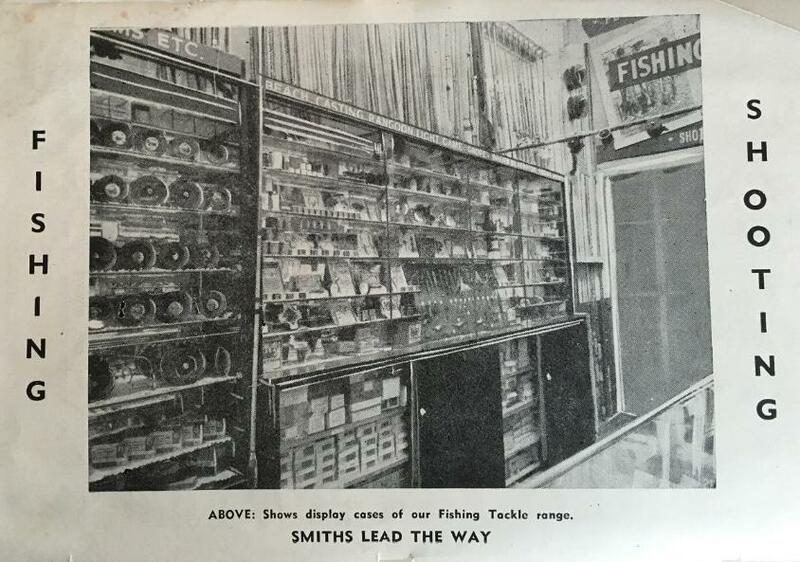 This section is dedicated to companies that had some involvement in the distribution of sporting goods but specifically fishing tackle and fishing lures. It starts with the oldest, historical companies where information can be found. 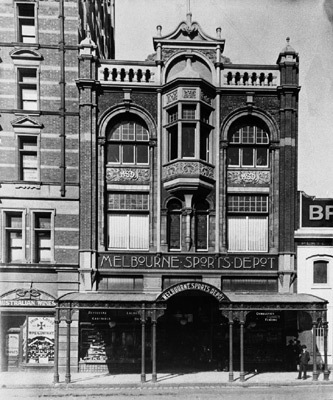 Melbourne Sports Depot was the biggest sports store in Melbourne before 1900. Catalogue shown below left dates to 1885. 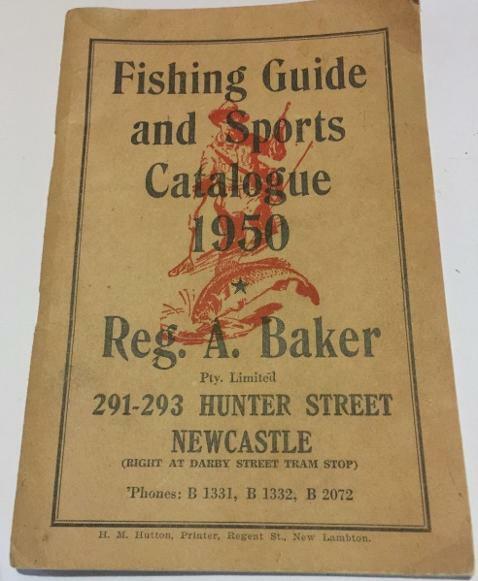 An absolute giant of the early Sydney trading scene with perhaps one of the biggest stores in Australia's history that did carry a large range of fishing tackle throughout the years they were trading. 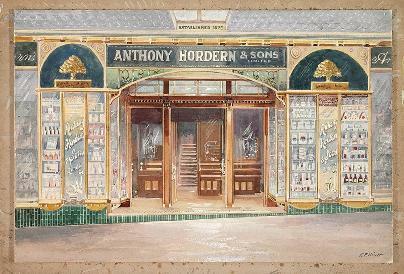 'Anthony Hordern & Sons was once the largest department store in Sydney, NSW, Australia. 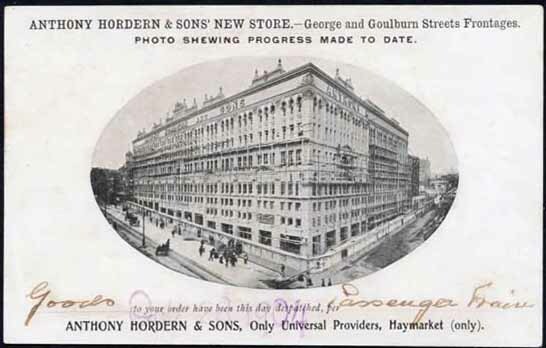 With 52 acres (21 hectares) of retail space, Anthony Hordern's was also once the largest department store in the world. The historic Anthony Hordern building, which was located on a blocked bounded by George, Liverpool, Pitt and Goulburn Streets, on what was a small hill called Brickfield Hill. ' from Wikipeadia. 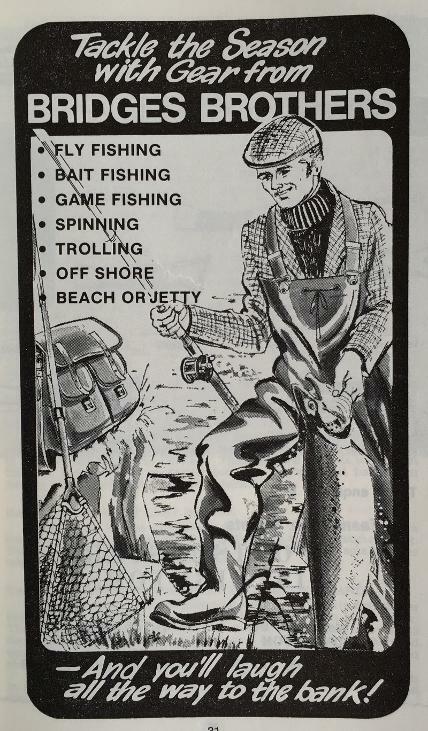 The 'Fisherman's Pocket Guide' is undated but the content indicates 1940 or before. 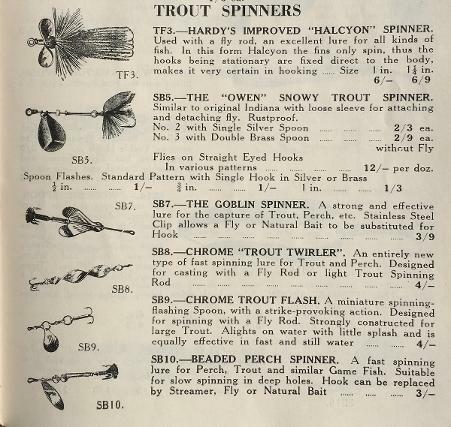 The large wood spinners for game fishing look similar to the big South Bend lures Zane Grey bought over for his angling adventures in Australia and the Pacific region. 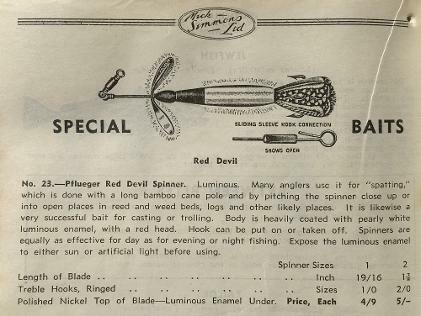 The Tango Spinner was a copy of the earlier Rush Tango minnow made in USA as early as 1919. 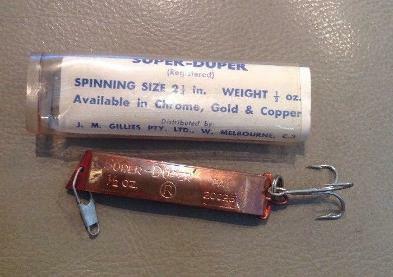 Also listed is the Sydney Spinner, Tandem Aeroplane spinners, Mackeral spinner and the Warnambool spoon bait. 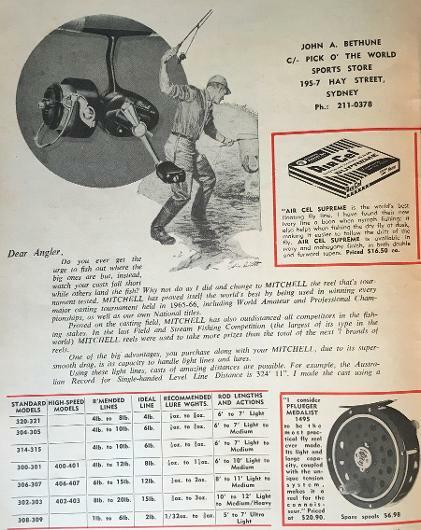 Mick Simmons is an iconic Australian company that sold sporting goods but also specialised in fishing tackle and was based in the Sydney CBD. The original store was in Haymarket before the company expanded throughout the Sydney metropolitan area and had a number of stores in King St, Pitt St, Oxford St, Newtown, Parramatta and Balmain as well as Newcastle. The 1918 'Surcatch' catalogue lists a store in Brisbane. 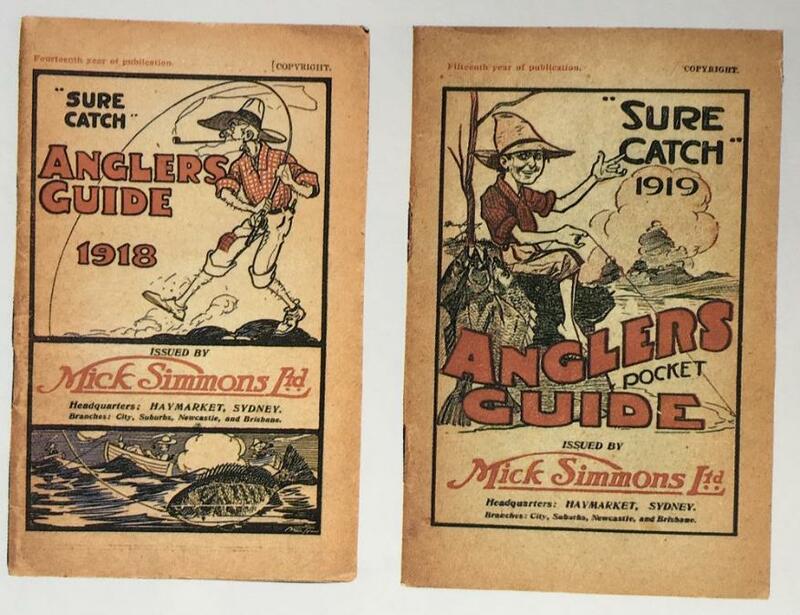 Mick Simmons released the 'Surecatch' Anglers Guides which started in 1904. 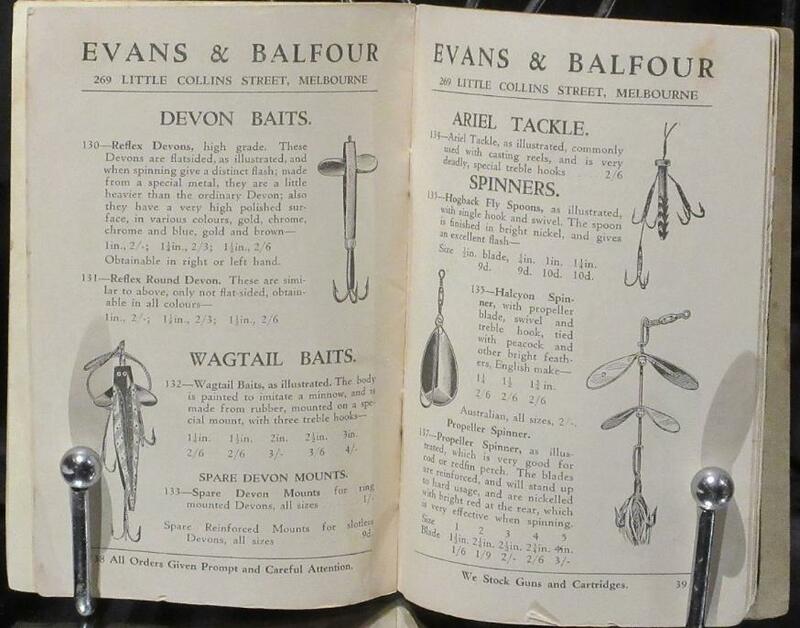 The two publications shown above were pictured in Dunn's book 'Angling in Australia' and are in the Mitchell Library. 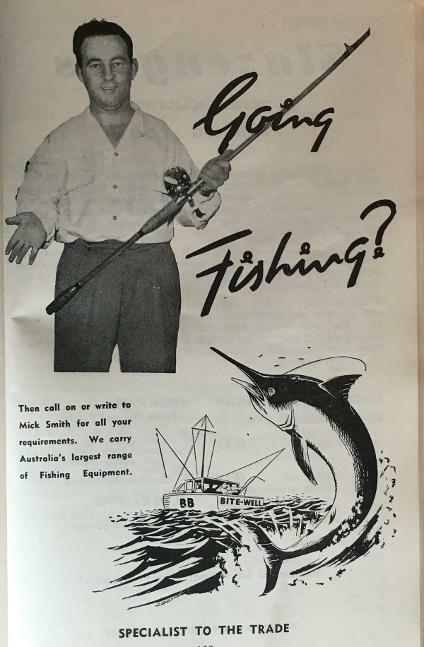 Mick Simmons lure advertising from the 1936/37 Surecatch Angling Guide. By this stage Mick Simmons had a number of outlets throughout the metropolitan area and Newcastle. Note the earlier Brisbane outlet is no longer listed. As mentioned previously Pflueger and many other large lure manufactures were firmly established in Australia by the 1920's and they dominated much of the lure range in the early days. 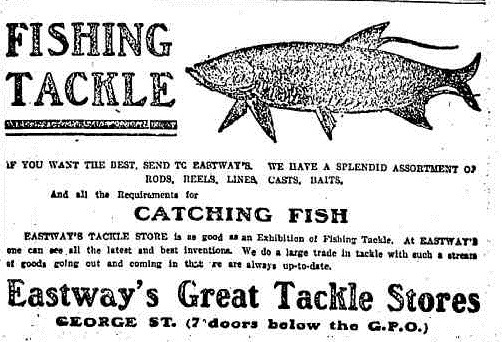 Eastways is an early Australian company that was started by the Eastway Brothers and were selling fishing tackle as early as 1899. 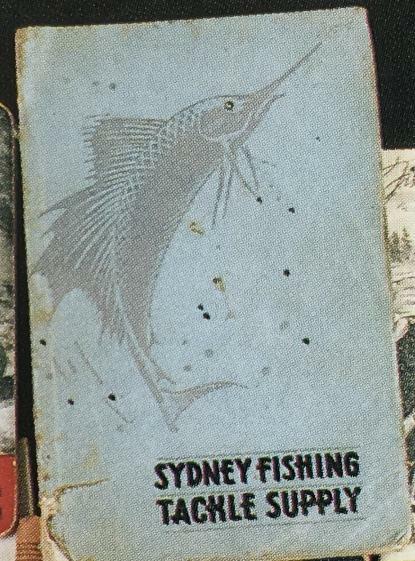 The advertisement below is from the inside cover of a very rare book by Sid Bellingham entitled 'Ten Years with the Pallette, Shotgun and Rifle on the Blue Mountains, NSW' - a complete guide to the shooting and fishing to be obtained on the Blue Mountains. Most interestingly it shows an early slotted devon with the early rigging and indicates that lures were being used and accepted by 1900. This book was released in 1899. 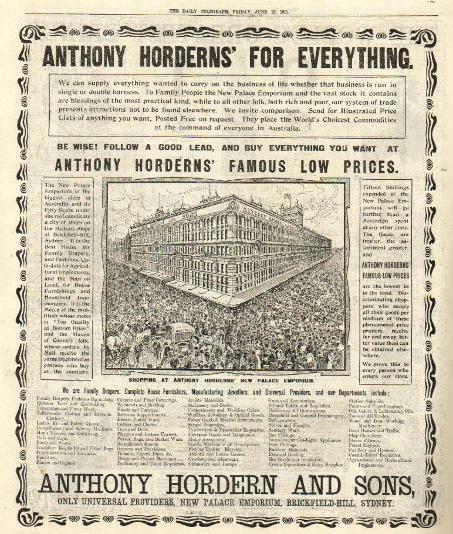 The advert shown right is dated to 1908 when Eastway's was situated at 409 & 411 George St, Sydney. The spectacular advert right is dated to the 1920's after the company had moved. "Charles Cowles (1837-1923), gunsmith and firearms dealer, was born on 8 March 1837 at Topcroft, Norfolk, England, son of James Cowles, publican, and his wife Honour, née Seago. On 28 February 1864 at Walworth, Surrey, Cowles married Cecilia Emma Dunn; with his employer, William Green, they migrated to Queensland. After moving to Sydney in 1865 Green became ill, decided to return to England and left the gunsmithing business he had established at 96 Market Street, Sydney, to Cowles. In 1867 he moved to 205 Pitt Street, and in December 1875 to Cannon House, 411 George Street. In 1885 he formed the partnership of Cowles, Dunn & Co. with his brother-in-law Arthur Dunn. 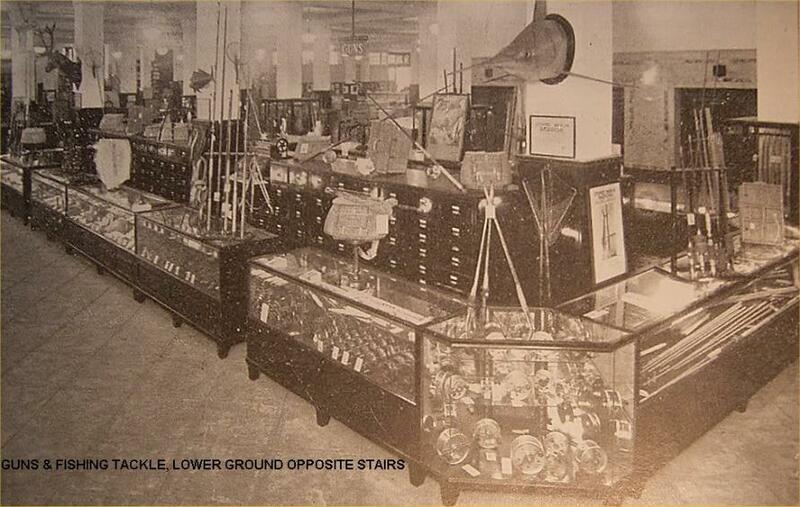 About 1892 the name of the business changed to Cowles & Dunn, by which it was known until after World War II. Cowles was an accomplished shot; he had been a member of the Metropolitan Pigeon Club and in the late 1880s was a member of the North Sydney Gun Club. In 1884 he moved his home from Hadleigh in North Sydney to Myahgah, Belmont Road, Mosman, and from June 1893 to January 1898 was a member of the first Mosman Council, serving as alderman and as second mayor. He returned several times to England, the last in 1904, and visited America. He died at Mosman on 24 December 1923, predeceased by his wife by a few months, but survived by four sons and four daughters of their ten children. He was buried in the Congregational section of the Gore Hill cemetery. His home Myahgah became Mena Hospital. Cowles Road and Myahgah Road, both in Mosman, perpetuate the memory of Charles Cowles, gunsmith. The gunsmithing business of which Cowles was principal was undoubtedly the largest in Australia during the second half of the nineteenth century. Cowles was agent for the English gunmaking firm of W. & C. Scott & Son. Numerous firearms, quite possibly made in England, bear the names of C. Cowles; Cowles, Dunn & Co.; and Cowles & Dunn." 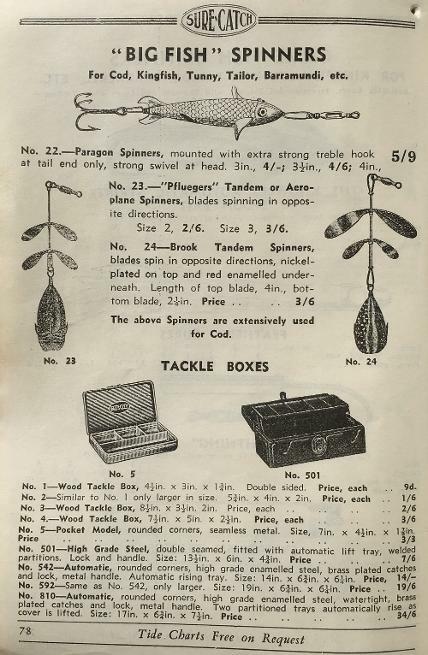 Cowles and Dunn Fishing Tackle catalogue Sydney 1939/40 which are a great resource and give a snapshot of was what available at the start of World War II. 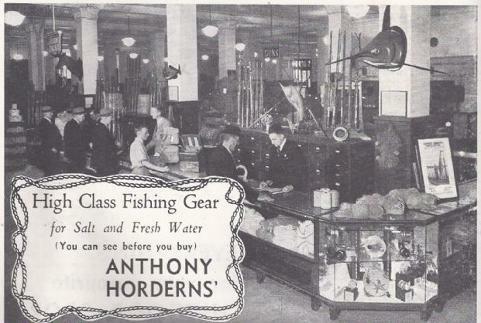 Craig and Aitken were one of the larger distributors of all manner of fishing and angling products from their base in George St Sydney. 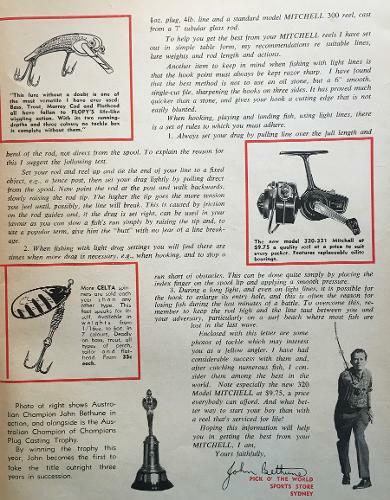 The extracts below are from the 1954 Angler's Guide which has lots of valuable information on lures that were available in the early 1950's when Australia saw the emergence of cottage and mainstream lure makers. 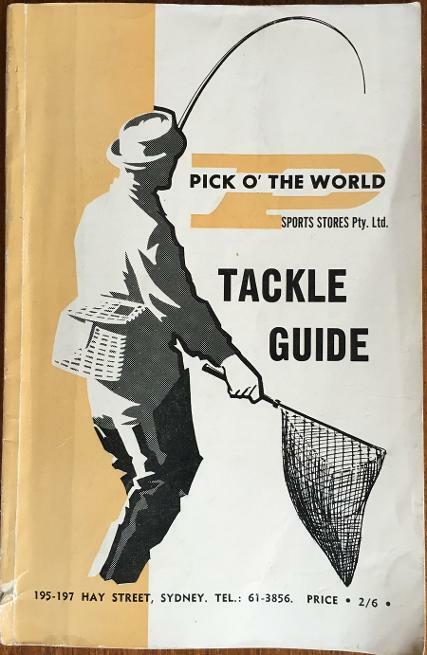 Alcock and Pierce were another of the big sporting goods companies in Melbourne who released specialist fishing tackle catalogues. 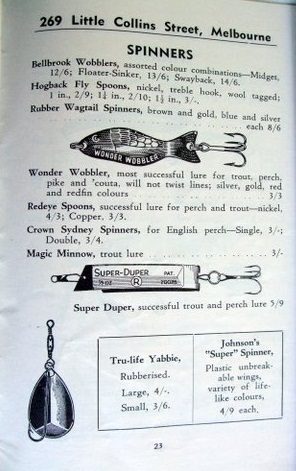 The extract shown right is from the 1935/36 catalogue and the lure shown below is in the Australian Tackle Museum and a fine example of this early advertised lure. Remembering this is a massive lure at 11 inches long and was expensive for its time. Keeping this in mind they are rare as many would have been lost and only a small amount circulated due to the cost of the lure. 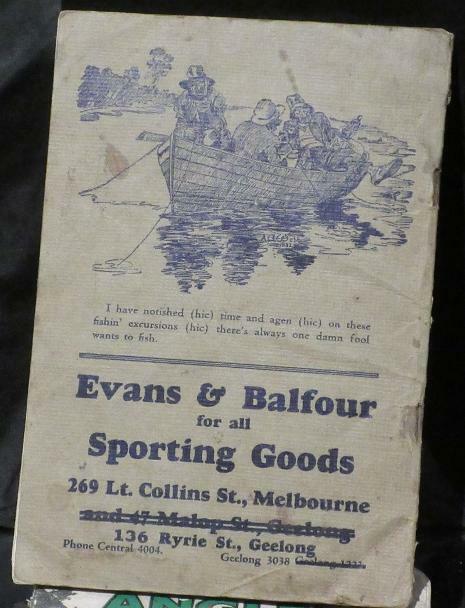 Evans and Balfour were a big sporting goods company in Melbourne who did release specialist fishing tackle catalogues. They were located in Little Collins Street, Melbourne and also had two branches in Geelong at one stage. 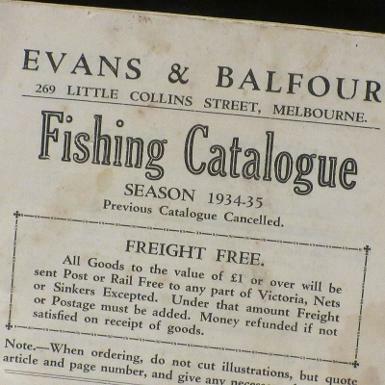 The catalogue shown is for the year 1934/5. 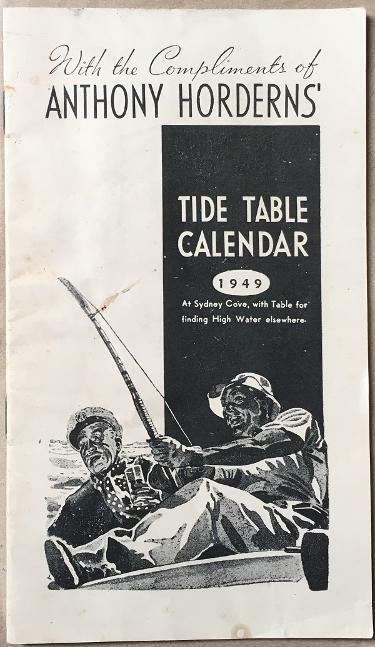 The images for this catalogue were kindly shared by Bernie Ladd from The Australian Reel Collectors Association of Australia. 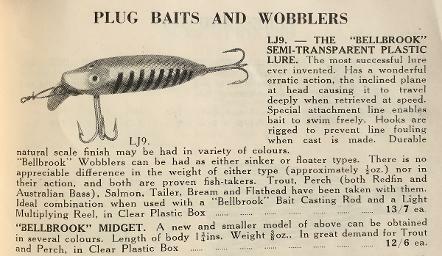 Again this catalogue is undated however the lures indicate at least 1952/3 as the Bellbrook 'Swayback' is advertised. 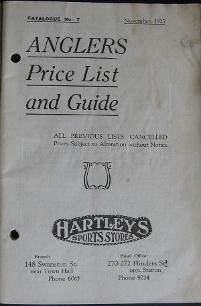 The Hartleys Sports Stores came into existence around 1920 in Melbourne and like Mick Simmons and Anthony Horden they released Angling guides and catalogues that have become not only collectable but also a great source of information for collectors and historians. 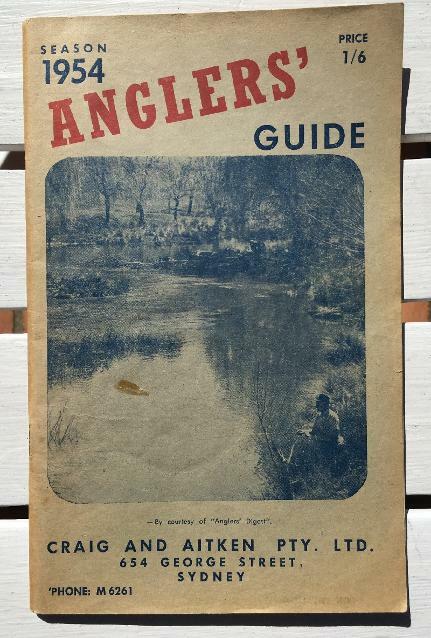 There are a number of earlier publications that were released including catalogues from 1926 into the 1930's and 'Tips for Anglers' which was an inhouse publication for Hartley's Sports Stores who were based in Melbourne. J. Malcolm Gillies (1900-1977) of Victoria was a major creative and commercial influence in Australian fly fishing in the 1930's and early post-war years. Though a Victorian, Gillies was strongly focused on Tasmania. 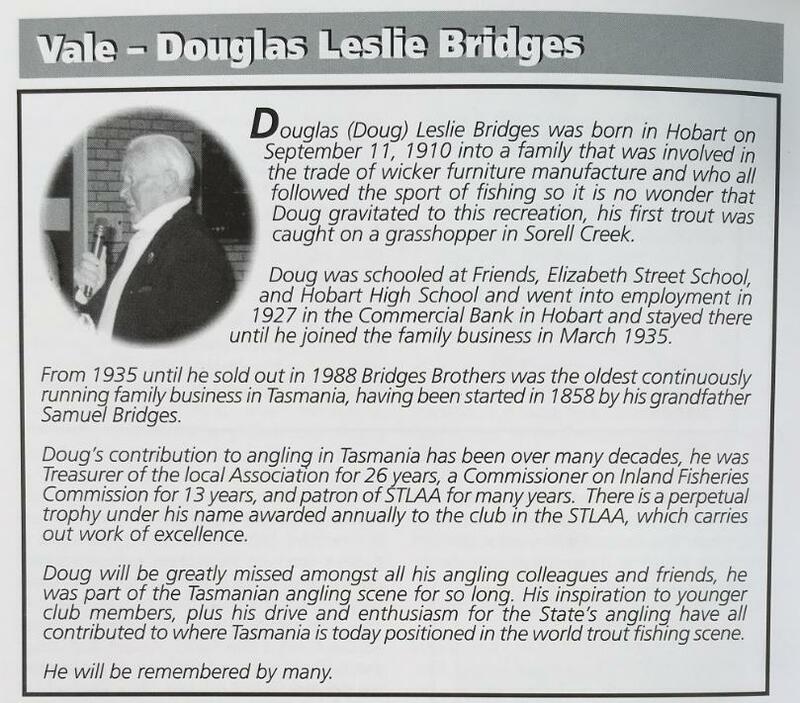 He mainly fished the lakes of the central plateau, encouraged by Launceston car dealer Doug Hollis, for whom he worked from 1925 to 1928. At the onset of the Great Depression, he returned to Melbourne. After making some rods and flies for friends, he decided to make it his full-time work. He set up business from a workroom in his parents’ residence in the grounds of the University of Melbourne, where his Scottish father was a Professor at Ormond Theological Hall. In 1933 he married Jeanne Fawkner of Launceston. Gillies’ rods were mainly powerful and fast-actioned, to cope with Tasmania’s high-country wind. His energy-efficient casting technique was based on the same ‘vee-grip’ hand position he used as a scratch golfer. 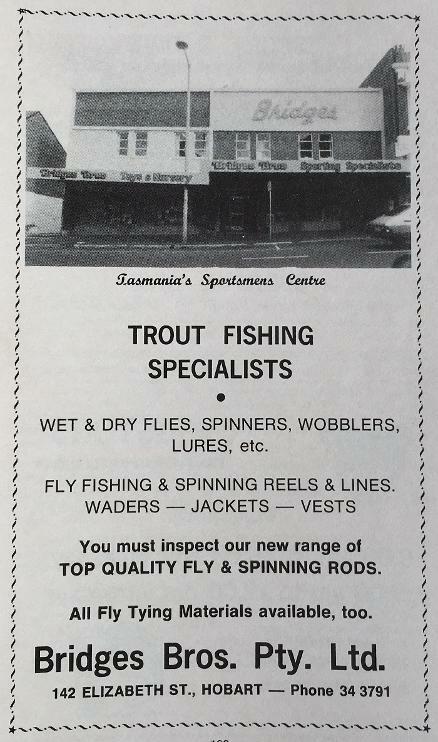 This distinctive influence is still felt today among some top Australian tournament casters and fly fishers. Gillies himself won a number of distance and accuracy events at state and national level. 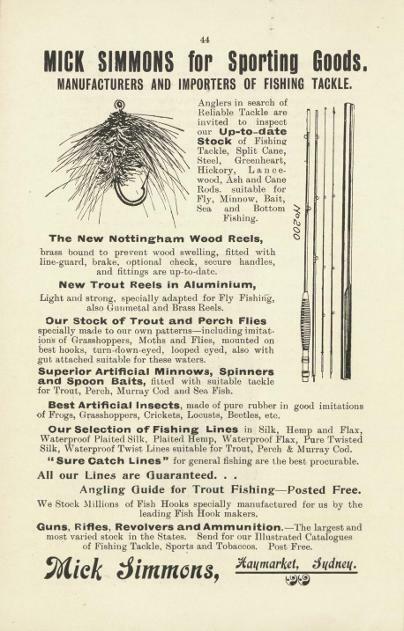 As well as his rods, Gillies designed fly reels and had them made in England. With the aid of three assistants he also made and sold many flies, both standard and his own invention. The most famous were his beetles, evolved when the Great Lake rainbow trout fishery was at its peak, and his Penstock Brown, an imitation of the mayfly species then dominant at Penstock Lagoon. 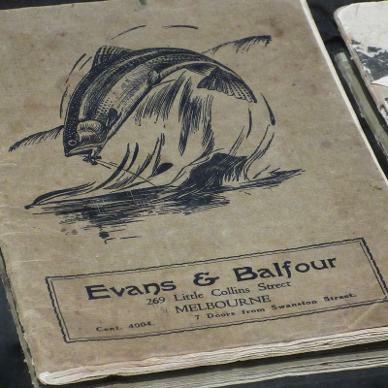 His elegant early tackle catalogues are now highly valued collectors’ items. J.M. Gillies became a proprietary company after World War II, and shifted emphasis from manufacturing to importing. Malcolm Gillies sold the firm on his retirement to Tasmania in the early 1960s, but as J.M. Gillies Agencies it remains a major player . . ."
J.M. 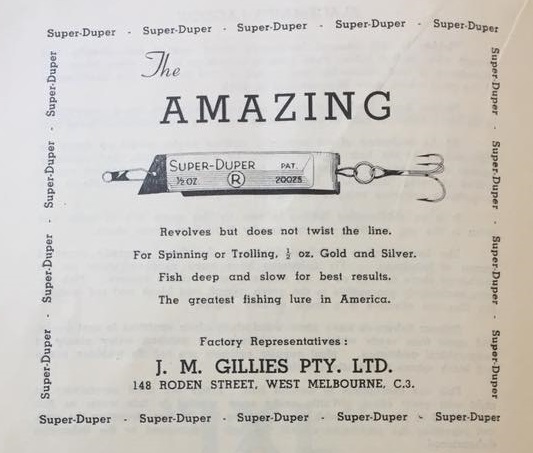 Gillies was instrumental in importing many lures from overseas including the USA made 'Super Duper' which was eventually released under rights by Wonder Lures. Lure below is in tube with J.M Gillies paperwork. Advert is from 1958 in a Tasmanian publication. 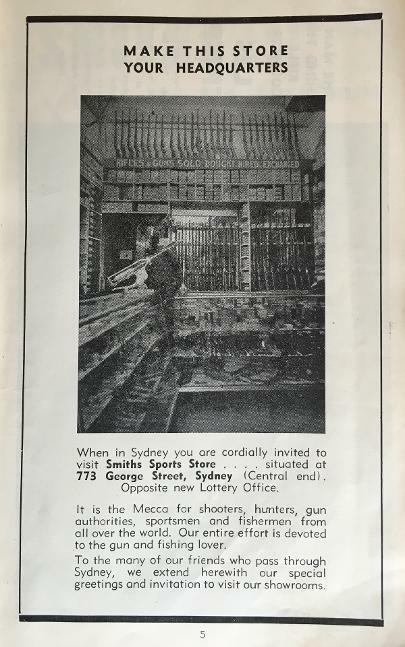 'Sil purchased a gunsmith store which was located firstly at 110 Bathurst Street Sydney and later moved to 143 Elizabeth Street, Sydney. Although he wasn’t experienced in this area of business Sil developed the store’s activities wider into the areas of fishing and other sports. He promoted his business so well that it became known throughout Australia. Sil died suddenly (probably from a heart attack or stroke) on 24 March 1945 and was buried at the Eastern Suburbs Crematorium, Botany, Sydney. His obituary (opposite) was published in the Sydney Morning Herald on Tuesday 27 March 1945. His wife Laura who was born in Newcastle, NSW in 1890, lived to be 91 years old. They had no children. The funeral of Mr Sylvester Edwin (Sil) Rohu, who died in his home, The Crescent, Vaucluse, on Saturday, took place at the Eastern Suburbs Crematorium yesterday and was largely attended. Mr Rohu, who was aged 62, was a returned soldier of the 1914-18 war. He was well known in sporting circles. 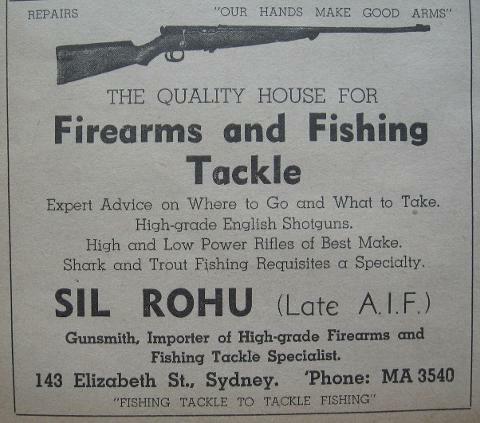 His gunsmith and fish-tackle shop in Elizabeth Street was the rendezvous of many sportsmen. His chief hobbies were deep-sea fishing and sailing. He is survived by Mrs Rohu." 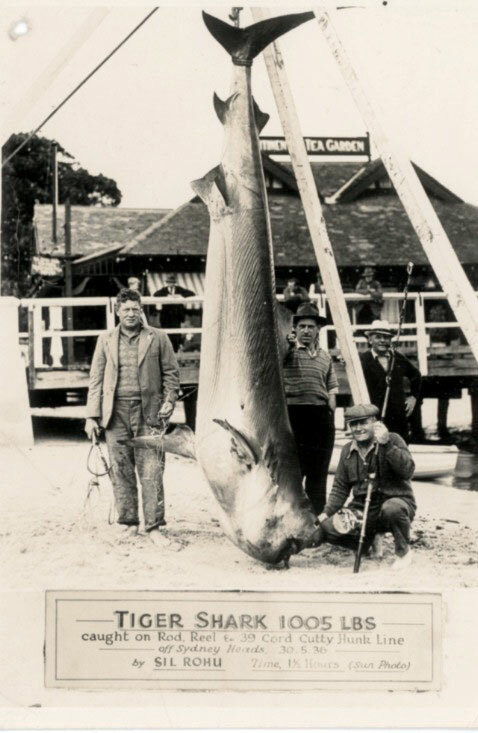 The photo right shows Sil Rohu with a large tiger shark that was caught off Sydney Heads in 1936. 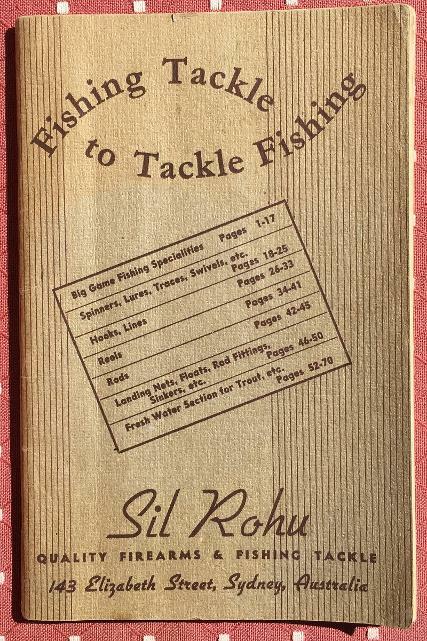 Although his primary business from very early was firearms, gun sales and repairs, Sil Rohu quickly became a big player in the sale of fishing tackle prior to World War II. 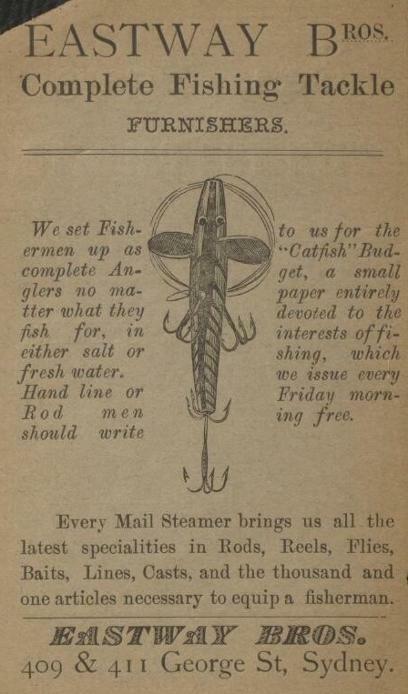 The Australian Fishing Museum showcases a lure that was made by Sil Rohu and was definitely influenced by Zane Grey and the angling fever that followed his visit to Australia in 1936. The lure is engraved 'Zane Grey Chrome Teaser. Sil Rohu. Sydney. Patent Applied For'. An incredible historical lure no doubt. 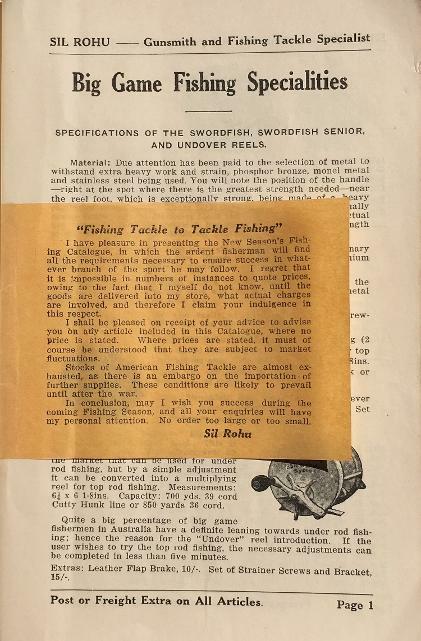 The catalogue below is dated November 1941 with insert explaining that existing stocks of USA made tackle was 'almost exhausted'. 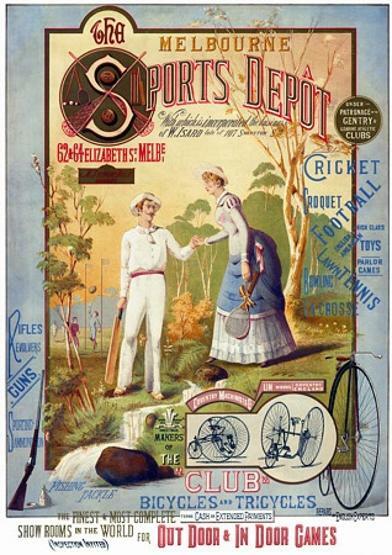 Smiths Sports Store was originally located in George St, Sydney and released regular fishing and hunting catalogues each year. 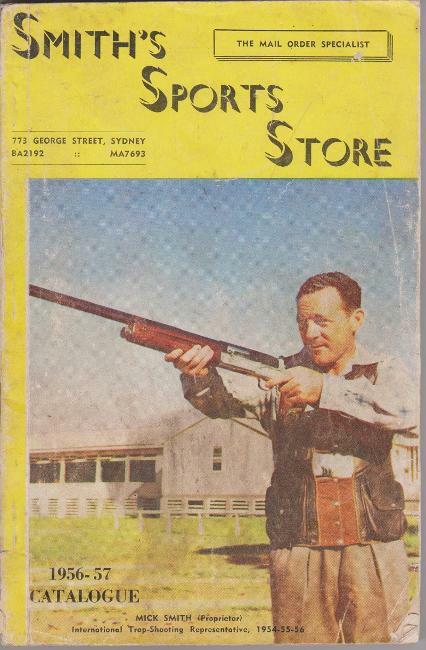 Mick Smith was the proprietor and was a champion shooter and representative in competition trap shooting. 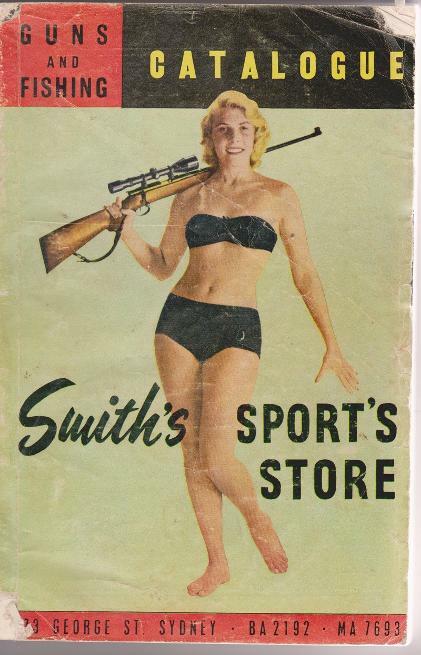 Smiths Sports Stores started in supply of guns and ammunition before expanding into hunting and fishing as their core business. A rare catalogue which showed up in 2017 on Ebay. First one seen and dates to 1950 and company was based in Newcastle, NSW. The advertisement dates to 1949. A Sydney based company situated in Kent St Sydney. 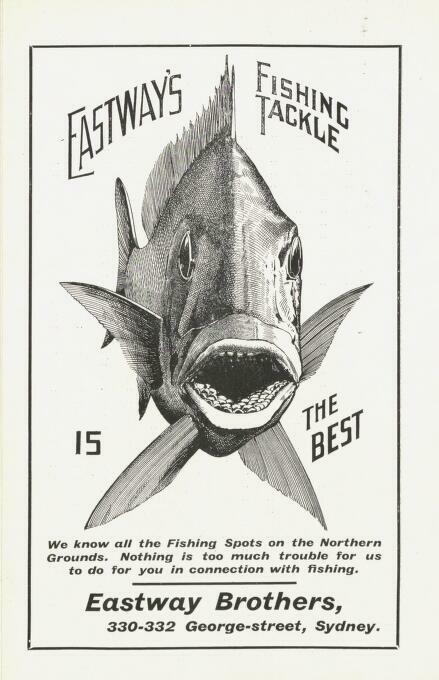 Dated to 1948 the advertisement below shows a feathered tuna lure that was available in six sizes from a quarter of an ounce through to 2 ounces. Scan courtesy of the Australian Fishing Museum. Another Sydney based company that was active in the late 1950's and into the 1960's. 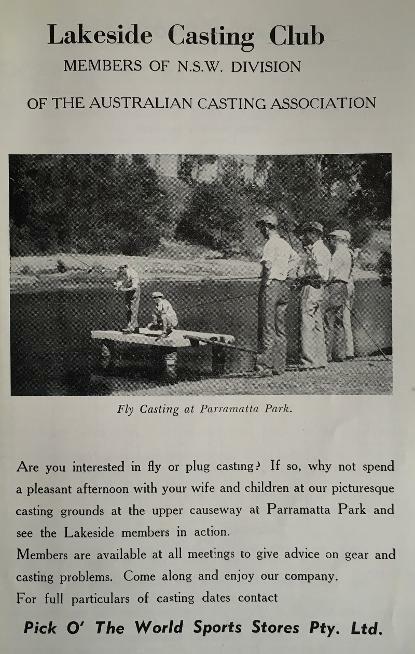 Catalogue shown is from 1959/60 and shows an advertisement for the Lakeside Casting Club which was based at Parramatta. 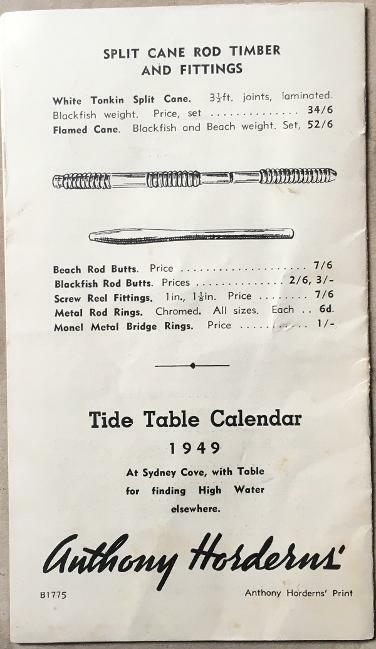 The catalogue has some interesting information with pricing for Australian made lures including Hardy's, Stewarts and Tillins.